You face a lot of challenges every day. Renting equipment and getting rental advice shouldn’t be part of them. At the Cat Rental Store we’re built to meet your rental needs. When it makes more sense to rent than to buy, Ohio Cat’s Cat Rental Store is the preferred rental source for professional contractors in Ohio, northern Kentucky and southeastern Indiana. 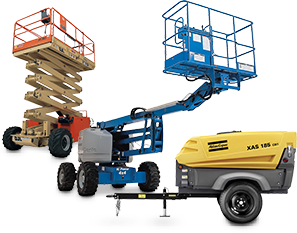 From backhoes to boom lifts, we have the equipment, service and support to give maximum return on your rental dollar. The Cat Rental Store is the solutions provider for our customers. We offer a convenient and consistent one-stop shopping experience and are able to handle your entire job site and industrial equipment rental needs. With a complete selection of Cat products, work tool attachments and complimentary equipment from the best brands in the rental industry, we offer short and long term rentals, and also sell new and used equipment at the Cat Rental Store. We’re ready when you are with tools and equipment, expertise and advice, and service wherever the job may take you. And it’s all designed to make your job easier. Are you ready to get started? Get our our newsletter for the latest announcements and special offers! The Cat Rental Store offers the right equipment for pump and excavation projects. Whether you need standard portable pumps, larger pump systems, or custom pump systems designed to solve a specific problem, our specialists can work with you to provide the right pump and parts needed for your specific application. Our experienced representatives can assist with your project needs, providing Cat excavators, Gorman-Rupp pumps, and GME trench shoring to get the job done. GOT A JOB TO DO? WE'VE GOT YOU COVERED!